Founded in February 2006, Go Squared, a Real-Time Analytics provider, is one of the UK’s fastest growing online companies. Go Squared focuses on providing simple ecommerce analytics that scale from the immediate needs of new entrepreneurs to the various functions required by a government body. When you’re running a company that relies on the web for a significant portion of its revenue, it’s important to know how your investments in online advertising are performing. No one has to sell you on your need for ecommerce analytics. Go Squared Real-Time Analytics helps provide immediate information, exactly when it matters. Go Squared, in its own words, promises that its product provides “the simplest analytics in the world.” There are 40,000 sites running on Go Squared’s web analytics platform. If your firm is high-tech from the bottom up and you need a real-time web analytics platform that’s flexible and customizable, Go Squared Real-Time Analytics has you covered. It even provides an API (Application Programming Interface) for your most demanding analysis. Go Squared is not only simple and flexible, it’s respectful of your privacy. Your data will never be sold or shared. Stay up to date and collaborate with your team with dashboards for communication and reporting. 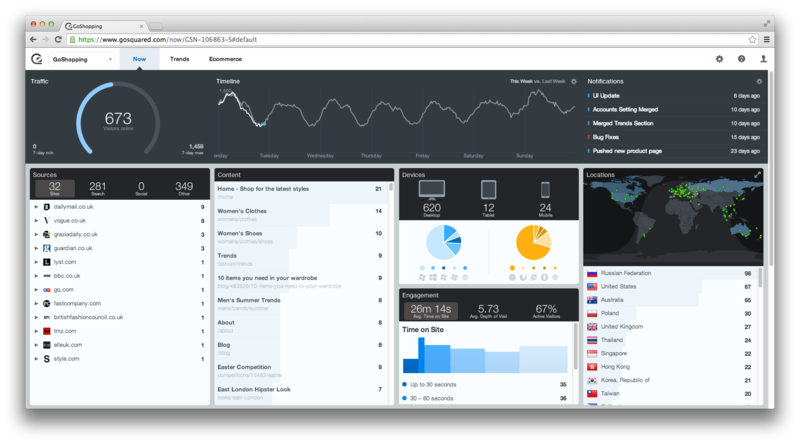 Go Squared makes it easy to monitor ecommerce stores, blogs, and web apps in a single location. This software works with many popular ecommerce platforms, including Magento, Drupal™, WordPress, Segment.io, and features one-click integration with the very popular Shopify ecommerce platform. Consider Go Squared when you need real-time analytics. Learn everything you need to know about GoSquared. Our experts will reach out to you shortly.